Acting Homeland Security Secretary Kevin McAleenan said Tuesday that his department needed more troops on the southern border, where he expected to leverage a “robust partnership” with the Department of Defense and continue making rapid progress on a barrier blocking unauthorized entry. He was responding to Fox News host Dana Perino on “The Daily Briefing” when she asked how he planned, without additional funding from Congress, to give voters the sense that the administration was making progress building the border wall that the president had made a central part of his 2016 campaign. He also pointed to support from the Department of Defense, which he said has been “critically engaged” in border security and freed up the border patrol to focus on primary law enforcement duties. Earlier in the day, Trump tweeted that the wall was “being rapidly built.” “The Wall is being rapidly built! The Economy is GREAT! Our Country is Respected again!” he said. For much of the president’s first term, he and congressional Democrats repeatedly clashed over the border wall. When the two sides couldn’t agree on the issue at the end of 2018, the government shut down and only re-opened alongside Trump’s decision to declare a national emergency in order to expedite wall funding. Trump has taken a multi-faceted approach to immigration policy and faced legal challenges to many of his decisions. On Tuesday, the Supreme Court heard oral arguments on his administration’s decision to ask about citizenship on the 2020 Census — a move Democrats blasted as illegal. During his interview with Perino, McAleenan reiterated the president’s concern about the law surrounding unaccompanied minors and migrant families at the border. He highlighted two particular changes he’d like to see from Congress. “The two targeted changes we need the most are the ability to detain families together through a fair and expeditious immigration proceeding,” he said. “And secondly, the ability to have unaccompanied children, who are being enticed into the smuggling cycle from Central America — being able to repatriate them safely in concert with the Central American government,” he said. A Department of Homeland Security official dismissed a report by The New York Times on Friday alleging that the president pressured Acting DHS Secretary Kevin McAleenan to close the southern border and offered him a pardon if the need arose. The Times, citing three sources familiar with the conversation, said Trump “urged” McAleenan to close the southwestern border. In the event of legal troubles, the story went, Trump said he’d pardon him. The conversation was said to have taken place before Trump announced on Sunday that McAleenan, U.S. Customs and Border Protection (CBP) commissioner at the time, would replace Kirstjen Nielsen, who resigned. Trump had made threats to close the border but after his trip to Calexico, Calif., last week, he seemed to back down. The Times report, however, alleged that the president privately pushed for the matter behind closed doors and was told by Nielsen that doing so would be illegal. Two days later she announced she would be leaving her post. The report stated that Trump “encouraged” McAleenan to disregard his predecessor’s warning and move forward with his request. Sources told the Times that it was unclear if Trump’s alleged remarks were meant as a joke. McAleenan is a longtime border officer, who previously practiced law in California and is seen by some as potentially taking the job of DHS secretary permanently. Fox News’ Kristin Brown and Frank Miles contributed to this report. 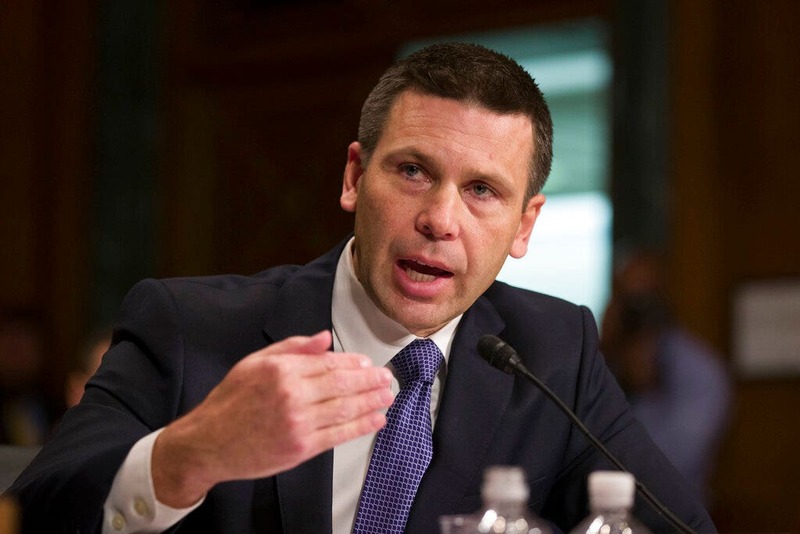 Newly-appointed Acting Homeland Security Secretary Kevin McAleenan on Thursday designated the current head of the Transportation Security Administration to be his deputy at the department, in the latest shake-up on the heels of Kirstjen Nielsen’s resignation. McAleenan appointed TSA Administrator David Pekoske to be the senior official to perform duties of the DHS deputy secretary. McAleenan also announced he would replace Pekoske at TSA with Patricia Cogswell, who currently serves as TSA’s acting deputy administrator. McAleenan’s announcement comes after a turbulent week for the Department of Homeland Security. On Sunday, following a meeting with Nielsen at the White House, President Trump announced that Nielsen had resigned as DHS secretary. Trump also announced that McAleenan, who was serving as Customs and Border Protection (CBP) commissioner, would replace Nielsen as acting secretary. Administration officials, though, told Fox News on Sunday that McAleenan best fits Trump’s requirement of being the “toughest cop” on the frontier, and that Nielsen had been viewed as resistant to some of the immigration measures pushed by the president and his aides. By Monday, U.S. Secret Service Director Randolph ‘Tex’ Alles stepped down from his post, after he was told to “prepare an exit plan,” in a signal, almost two weeks ago, that a transition in leadership at DHS was imminent. On Tuesday, DHS acting deputy secretary Claire Grady, who was technically next in line to replace Nielsen, resigned. By Wednesday, Nielsen announced that Immigrations and Custom Enforcement (ICE) Acting Director Ron Vitiello would be stepping down by the end of this week. Last week, Trump confirmed he had withdrawn the nomination of Vitiello to become the permanent head of ICE, telling reporters that “Ron’s a good man, but we’re going in a tougher direction, we want to go in a tougher direction.” Administration sources tell Fox News that the withdrawal of Vitiello’s nomination was the first step in Trump’s plan to control the border crisis. This week, reporters asked the president about the shake-up at DHS. “I never said I’m cleaning house. Who said that? Don’t know who came up with that. We have a lot of great people there,” Trump said this week. After Nielsen’s resignation last Sunday, officials said Monday that Secret Service Director Randolph “Tex” Alles was stepping down, and DHS’ acting deputy secretary Claire Grady – who was technically next in line to replace Nielsen – resigned on Tuesday.